Austrian painter. He studied at the Vienna Akademie and, in 1755, he went to Rome, where he was based for the rest of his life. 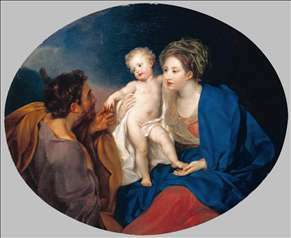 From 1756 to 1761 he was first the pupil then the assistant of Anton Raphael Mengs. In 1765 he married Mengs s sister, the miniature painter Theresia Concordia Mengs. After collaborating on Mengs s fresco paintings in Rome (at S Eusebio and the Villa Albani; both in situ), Maron, working independently in Rome, spent some time on altar pictures (S Maria dell Anima) and on various decorative projects. Mengs s influence is evident in Maron s ceiling pictures in the casino of the Villa Borghese (1784; in situ), where five paintings tell the Story of Aeneas and Dido in the style of quadri riportati, using clear construction, sharply defined drawing and a historical concept based on antiquity. Although he received many commissions for this type of work, Maron s true gifts lay in the field of portraiture. When Mengs was appointed court painter to Charles III of Spain and left Rome for Madrid in 1761, Von Maron took on many of the commissions which would once have gone to Mengs, and he quickly emerged as one of the leading painters in Rome. 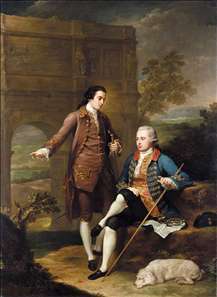 It was during the latter half of the 1760s that Von Maron established his reputation as a portrait-painter, meeting the needs of the Grand Tourists and, in particular, of English gentlemen passing through Rome, much as Pompeo Batoni had been doing since the 1740s. Along with Pompeo Batoni, Maron was the most celebrated portrait painter in 18th-century Rome, and he received an enormous number of commissions from princes, diplomats and church dignitaries and from English aristocrats visiting Rome as part of their Grand Tour. Maron painted such sitters in the same style as did Batoni, usually full-length and life-size, in elegantly fashionable dress, against backgrounds of Classical sculptures and views of Rome. Portraits such as those of Francis, Prince of Anhalt Dessau (Wrlitz, Staatliche Schlsser und Gärten), Sir Robert Clive (1776; Rome, private collection), Sir Archibald Menzies (Cambridge, MA, Busch-Reisinger Museum) or Cardinal Franz Hrzan (Rohrau, Schloss) are distinguished not only by their elegant presentation and harmonious delicacy of colouring but also by strong characterization: the sitter s activity and interests are conveyed with insight. See more details about "Madonna and Child with a Shepherd"
See more details about "Portrait of Two Gentlemen before the Arch of Constantine in Rome"